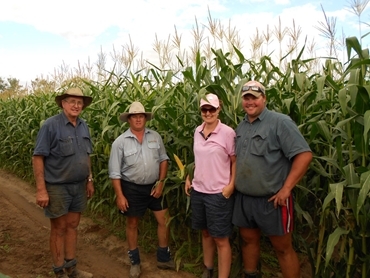 Agronomist and grower Kelly Becker and her husband Scott grew a corn crop just shy of 10t/ha at the Theodore property Paranui despite sowing into the farm’s least fertile soil. They sowed 34ha of PAC 727 in mid-February in the sandy loam part of the property, which ranges from heavy black clays to melon-holed brigalow and sandy forest country, under the Southern Cross centre pivot irrigator purchased in 1996. Mrs Becker describes the soil as a hard setting sandy soil, which brings with it inherent difficulties such as getting crops to emerge well after planting, poor root structure during the crop’s life and low soil fertility. She explains the soil needs to be managed correctly to be able to grow crops well. At harvest in mid-September the crop yielded 9.90t/ha with a big blocky grain size, with the grain contracted to Defiance. Mrs Becker said the established plant population was 70,000/ha with ‘very good’ evenness of flowering and ‘excellent’ seedling vigour. The property has changed substantially since it was acquired by the Beckers for grazing in the 1930s, adding irrigated cropping to its business interests in 1983 by utilising the adjoining Dawson River. Development of the land has enabled the Moura district farm to build a diverse and sustainable business. The farm is diversifying its risk and keeping up with the times by using current best management practices such as minimum till and precision ag. This year’s corn was grown as a cash crop to supplement the other business activities at the 3117 ha property, which now includes cattle breeding and finishing, as well as irrigated and dryland cropping. According to Mrs Becker, the farm grows oats to feed the steers and round bale Rhodes grass hay for weaners and as a drought reserve. A key objective has been to plant the cash crops under the pivots, which have produced a wide range of crops such as lucerne, wheat, sorghum, corn, mungbeans, peanuts and sesame. When she’s not consulting with growers on the production of wheat, corn and sorghum crops or fulfilling her role as a GRDC Northern panellist, Mrs Becker farms Paranui with husband Scott Becker and his parents Norman and Desley. She moved to the property at the end of 2009 and started full time at the beginning of 2012. The crop was sown into a full profile of moisture at a rate of 72,000/ha using a MaxEmerge vacuum double-disc opener on 1m rows. Pre-plant fertiliser was made up of a customised NP(20)K(30)SZ blend based on soil tests with further urea being incorporated in the crop via side-dressing and fertigation through the pivot. The Becker’s chemical application for weed control was Atrazine 900 WDG at 3.3kg/ha with 1 inter-row cultivation. Looking to the future, Mrs Becker is considering planting this season’s corn crop in mid-to-late January to help obtain a quicker dry down for harvest and is looking into growing Pacific Bio Fumig8tor from Pacific Seeds to help manage their nematode numbers in their paddocks and assist with nutrient cycling in the sandy soils.